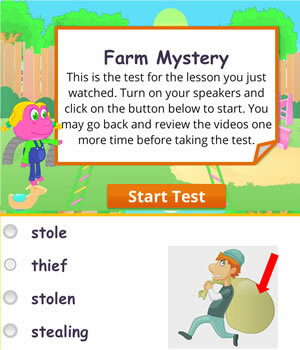 Teach children language used when talking about a mysterious phenomenon. EFL/ESL learners will learn how to use impersonal pronouns to talk about things or people who are yet to be revealed or unknown. They will also be introduced to related words like ‘maybe’ which are commonly used in similar circumstances in this English lesson. 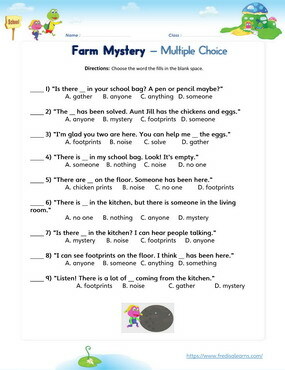 By learning to ask and answer questions relating to solving a mystery, English learners will develop a valuable communication skill. The worksheets below are useful for offline and classroom activities. 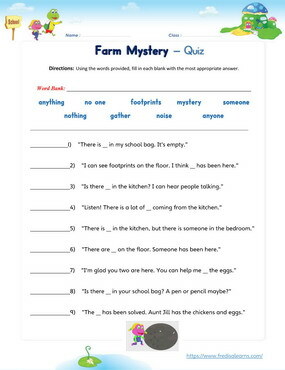 These printable exercises directly correlate with the above lesson 'Farm Mystery'. Every worksheet comes with an answer sheet on the second page for educators. Freddie and Lisa have just arrived at Uncle Joe’s farm. Uncle Joe is happy to get a helping hand. He asks them to help him gather the eggs. When they arrive at the chicken coop, the chickens and the eggs are nowhere to be found. Perhaps the chickens and eggs have been stolen. Lisa finds footprints and chicken prints on the floor and they begin following the trail of footsteps that leads to a noisy kitchen door. When they open the door, they find Aunt Jill and the chickens safe and sound. 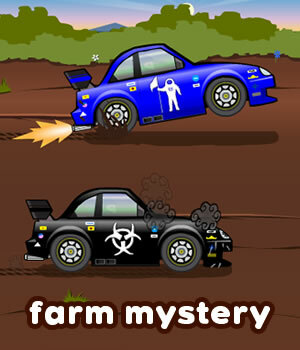 The two young detectives help Uncle Joe solve the farm mystery. Is there anyone in the kitchen? There is someone in the kitchen. Is there anything in your school bag? There is something in my school bag. There is nothing in my school bag. Do you know anyone who would take your eggs? Maybe someone was hungry and wanted the eggs. Lisa: Uncle Joe, thank you for bringing us to the farm. Freddie: Yeah, we love the farm, Uncle Joe! Uncle Joe: I am glad to have you two here. You can help me gather the eggs. Lisa: We would love to help you with that. Uncle Joe: Oh no, where are the chickens? Lisa: Are they usually here? Uncle Joe: Yes! They are gone, and so are the eggs. Lisa: Look, Freddie, there are footprints! Freddie: Oh, no. I wonder who they belong to. Lisa: I don’t know. This is a mystery. 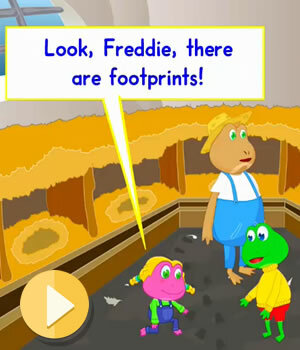 Freddie: Uncle Joe, we found footprints. Someone has been here. Uncle Joe: Let’s follow the footprints. Maybe we will find the chickens. Lisa: Do you know anyone who would take your chickens? Uncle Joe: No, I don’t. Freddie: Maybe someone was hungry and wanted the eggs? Uncle Joe: I don’t think so. Lisa: Look! Here are chicken prints! Uncle Joe: That’s a lot of noise! Lisa: Aunt Jill! What are you making? Aunt Jill: I am making scrambled eggs. Lisa: Oh! There are the chickens! We thought they were stolen! Aunt Jill: Stolen? No! I just got the eggs! They followed me in here. Uncle Joe: I am so glad they are safe! I was worried they might be hurt. Freddie: Yeah! It was quite the mystery. Lisa: But we solved it!